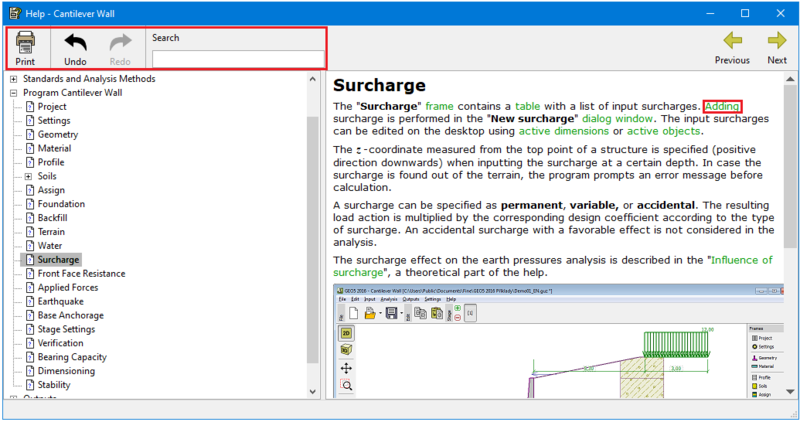 The contextual help for all GEO5 programs is displayed in a standard dialog window. Help can either be lauched by directing through the program menu (items "Help", "Content"), or by pressing "F1" button anywhere in the program. Some dialog windows (e.g., "Add new soils") allow opening a corresponding chapter of Help by pressing the help button " ". A tool bar with basic control buttons. The "Print" button opens the print dialog window. The ("Back/Forward") buttons allow listing through pages, which have been recently opened. The buttons "Následující" allows listing through pages in the "Tree". "Tree", which containst the list of topics - individual items in the tree are opened/closed by clicking the symbols " "/" " in front of the name. Window for displaying the help itself - the window header contains the name of currently shown page. The text of each help may contain further cross references to other items. The text of these references is colored in green.